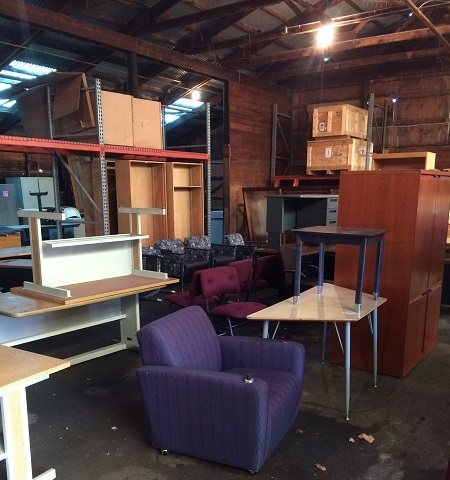 The Surplus Property Barn (SPB) acts as a showroom for unwanted but still useable equipment and furniture from all over the campus. Any University department may obtain surplus property for on-campus use. To obtain University surplus property a nonprofit organization must file a request to the OWM on organization letterhead and provide its 501(c)3 number or Federal Tax ID # as confirmation of its nonprofit status. The SPB generally contains old file cabinets, bookshelves, desks and chairs. Occasionally it contains old equipment used in building trades, cafeterias, laboratory or hospitals. The selection varies significantly over the course of the year. We are only open on Wednesdays from 9am to 10am. OWM lacks the staff to devote additional surplus barn hours. Viewing hours are usually sufficient to identify enough customers to keep the flow of incoming and outgoing property in balance. Surplus items that have remained in the SPB for over 30 days and in which there is no interest by nonprofit organizations are then either scrapped or placed by OWM on Municibid.com. This is a simple on-line bidding system made available by the UMass Procurement office. On-campus entities may select and remove items or reserve them for later pick-up or delivery by Moving Services.